Kurt Zouma is "very happy" at Everton but admits he will not consider his long-term future until the end of the season. The on-loan Chelsea centre-back has enjoyed a consistent run in the team at Goodison Park this season, making 23 starts and scoring twice. Zouma says his focus remains solely on finishing the season well, as the Toffees chase a top-seven finish in the Premier League. Asked whether he would like to make his switch permanent, the 24-year-old said: "I don't know yet. We have five more games to play and then we will see. "I am very happy. My aim was to come and play and improve myself and I think I have done here. I hope we will finish the season very high." Zouma had a new partner on Sunday in Phil Jagielka, a late replacement for the ill Michael Keane minutes before kick-off against Arsenal, and was impressed as the club captain scored the only goal in a 1-0 victory. 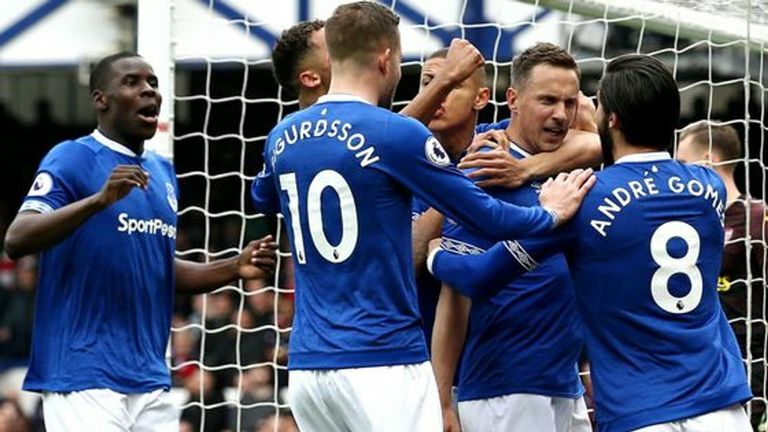 It was Everton's third successive win and they have also kept five clean sheets in the last six matches despite the defence set-up changing regularly. "We have more confidence and every one defends as a unit. Now everyone understands each other," added Zouma. "We hold the ball a bit better, we are more compact as a team as we defend together and attack together. "We are confident, are playing forward more and are playing better and we believe, but the season hasn't finished yet so we have go again next week and get a win. "It wasn't difficult (to play with the change) because we're used to working hard in training altogether. "The manager mixes defenders and we all know each other. Playing for the first time with the skipper has been good for me and he brings good experience for us me, Michael and Yerry Mina so we try to take all the experience he has. And his first goal in the Premier League this season was very important."